At the K2BSA tent, I go fox hunting with Scouts from N.C.
Like a trio of bloodhounds, three Scouts from Troop A120 out of Durham, N.C., were off to follow the digital scent. Eight minutes later, they found their prize: a hidden radio transmitter. Welcome to ARDF Fox Hunting at the 2013 jamboree’s K2BSA tent. Volunteers there made me an honorary member of the North Carolina team, though I did little more than get in the way. In fox hunting — part geocaching, part orienteering — Scouts use radios and homemade antennas to locate a hidden “fox,” or transmitter. I can definitely see the appeal. If the radios pictured above and below look like they were made out of PVC pipe and cut-up pieces of a tape measure, that’s because they were. The finished product is something that’s functional, safe and ingenious — exactly what you’d expect from a bunch of Scouters. Imagine a bunch of teenagers running around the crowded jamboree site holding thin slices of metal, and you get why PVC and tape measure pieces presents the perfect solution. They’re rigid enough but also flexible so they won’t hurt anyone. There’s a lot more at the K2BSA tent than just fox hunting, as longtime amateur radio veteran and my BSA colleague Jim Wilson explained. Scouts who have a free morning or afternoon can earn the entire Radio merit badge at the jamboree. They’ll get 90 minutes of classroom instruction, 30 minutes in front of a radio to make contact with someone, and 90 minutes of wrap-up. They’re done in less than four hours, Wilson said. Scouts who just want to try chatting with someone from another state or country can do that as well. 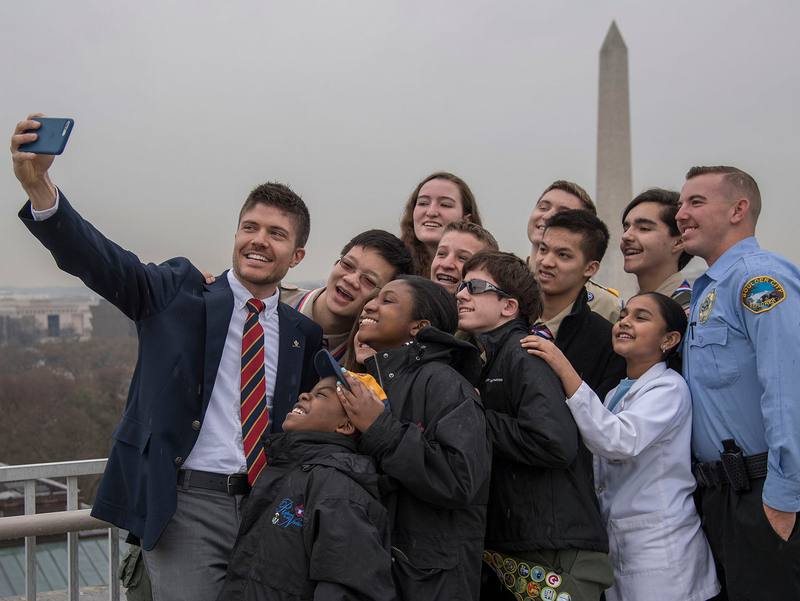 Already Wilson and his team of volunteers have helped Scouts make contact with dozens of U.S. states and 16 different countries. But these are more than just simple hellos between far-away radio operators. There’s even more. Stay tuned on Saturday when 10 lucky Scouts will get to speak live to astronauts aboard the International Space Station as it passes overhead. Now that’s some out-of-this-world excitement.